"The W. E. Nunnelee Bus Lines began passenger service from Tyler to Gladewater and Mt. Pleasant in March 1925; later added buses from Tyler to Henderson and Nacogdoches. Twenty-six vehicles were operated over the 205 miles. These included 7-passenger automobiles and 12-, 15-, 16-, and 19-passenger buses. Fare from Tyler to Gladewater was $1. with stops in Winona, Starrville, Friendship, the 30-mile run took an hour, over roads paved in 1919 and 1923. On Aug. 1, 1927, buses were placed under regulation of the Railroad Commission. This line had franchise No. 1; it was one of 247 companies running 865 public passenger vehicles on 20,348 miles of Texas roads. Many of these "buses" were autos built for private use. Others had "stretched" auto chassis seating 10 or more passengers. Several models had doors that opened along the side. Uncomfortable and hard to drive, they constantly needed new tires and repairs to brakes and valves. Breakdowns were frequent. Overhauls (often made, or necessity, by the roadside) were handled by mechanics lacking suitable tools. Although far different from the airconditioned, safety-engineered bus of today, early buses showed the way to a new era in convenient transportation. Incise in base: Early travel, communication and transportation series erected by Moody Foundation." 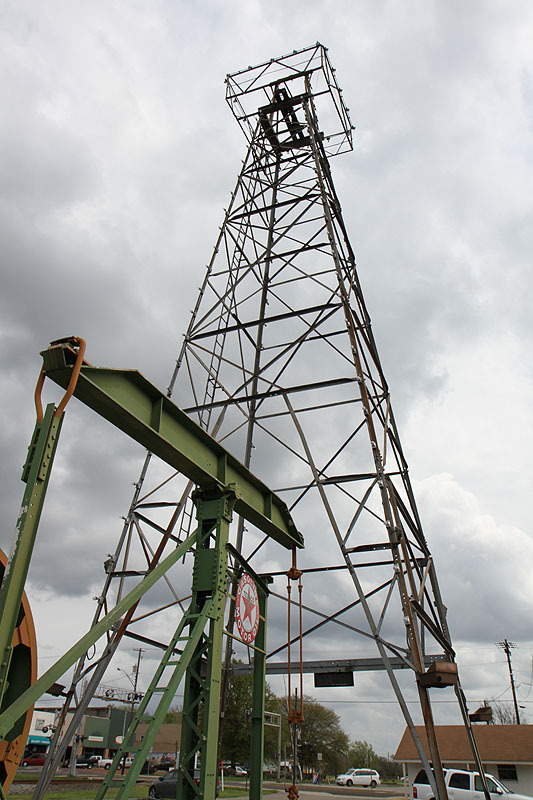 "On April 7, 1931 this wildcat well drilled by Selby Oil and Gas Co. of Tulsa, OK. came-in at 1000 barrels an hour. 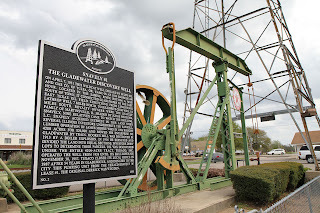 Located in the Sabine River bottom a mile south of town, it connect Gadewater to the vast East Texas Oil Field stretching from Longview's Lathrop Well 7 miles north, to Kilgo's Crim Well 14 miles south. Royalty owners were the Snavely family of Martinsville, IL. headed by judge Herschel Snavely, nine relatives came to watch the drilling. L.C. 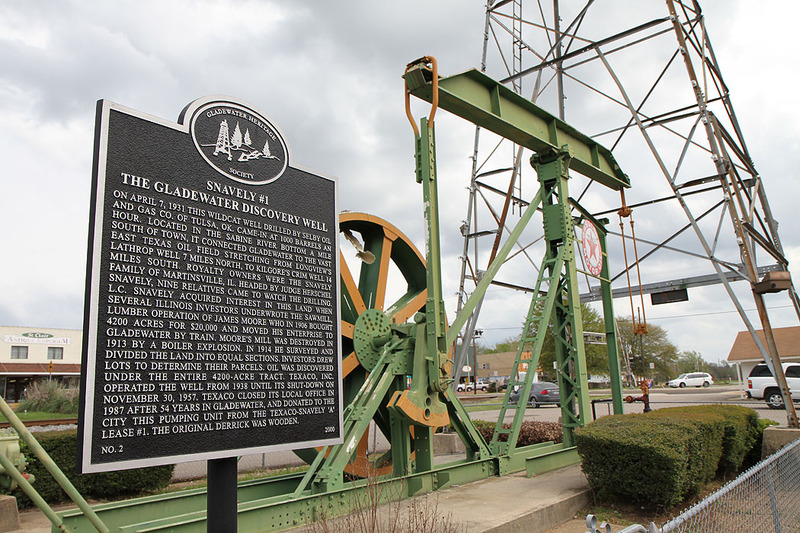 Snavely acquired interest in this land when several Illinois investors underwrote the sawmill, lumber operations of James Moore who in 1906 bought 4200 acres for $20,000 and moved his enterprise to Gladewater by train. Moore's mill was destroyed in 1913 by a boiler explosion. In 1914 he surveyed and divided the land into equal sections. Investors drew lots to determine their parcels. 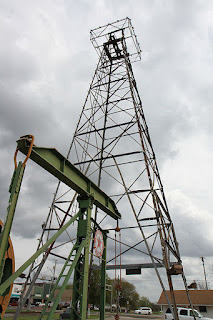 Oil was discovered under the entire 4200 acre tract. Texaco, Inc. operated the well from 1938 until its shut-down on November 30, 1957. 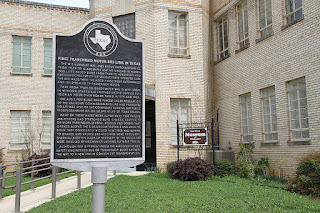 Texaco closed its local office in 1987 after 54 years in Galdewater, and donated to the city this pumping unit from the Texaco-Snavely "A" Lease #1. The original derrick was wooden."